Today I have the perfect card to brighten up your day and bring the sunshine in. The adorable "Lift Me Up" stamp set and coordinating Thinlits are simply amazing. 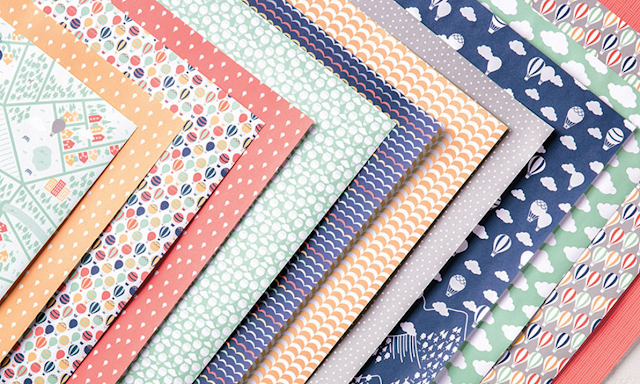 This bundle is so versatile and the combinations of design possibilities are endless. The beautiful, coordinating "Carried Away" Designer Series Paper makes a perfect backdrop for this card. It is an exclusive, FREE Sale-a-Bration product. It's free with a $50 order. Get yours today, while supplies last, at my Online Store. You'll be "Carried Away" before you know it!